Ayahuasca (pronounced EYE-ah-waas-kuh) tea is traditionally brewed from plants found in the Amazon. The formula varies, but the beverage always contains the bark of the vine Banisteriopsis caapi as well as leaves of a bush that supply a hallucinogen called N,N-dimethyltryptamine (DMT). On its own, DMT has little psychoactive effect. Mixing the two plants can induce a temporary change in consciousness. Taking ayahuasca can result in visions, intense emotions and recollection of personal memories. Users often report insights into behaviours they want to change. Why do people travel to take it? The drug DMT is listed as a Schedule III substance under Canada’s Controlled Drugs and Substances Act. It is therefore illegal to possess or trade in the chemical itself. It is also a restricted drug under Part J of the Food and Drug Regulations. “Substances listed in Part J of the FDR are substances that are considered to have no medical benefit,” a spokesperson for Health Canada said in an email. The plant itself is legal to own or sell in Canada, as well as in Peru. Traditionally, a shaman or religious leader administers ayahuasca along with tobacco smudging and other ceremonial rituals such as performing sacred songs. At underground tea ceremonies in Canada and openly in Peru as part of a spiritual ceremony, both those who have tried it for addiction as well as physicians urge those interested in ayahuasca not to consume it alone. In the last few years, Canadians who have travelled to Peru for the rituals have been killed during or after ayahuasca ceremonies. Likewise, headline-making cases for others who took the drug in Peru involved an American and New Zealander who both became sick and died, and a British man who died from violence during an ayahuasca ceremony. Most deaths associated with ayahuasca have been due to various plants added to the brew, the Australian Broadcasting Corporation has reported. In Britain, Frank, a drug advice service, warns DMT could have serious implications for somebody who has a history of mental health problems. Acute side-effects include vomiting and diarrhea, which shamans view as part of the spiritual purging aspect of ayahuasca to rid the body of trauma. In one review, researchers concluded the side-effect profile appears to be relatively mild, adding that more detailed studies are needed. Many medications can have serious consequences if taken with ayahuasca, including medications for depression, high blood pressure, some complementary medicines, and illicit drugs, including cocaine. 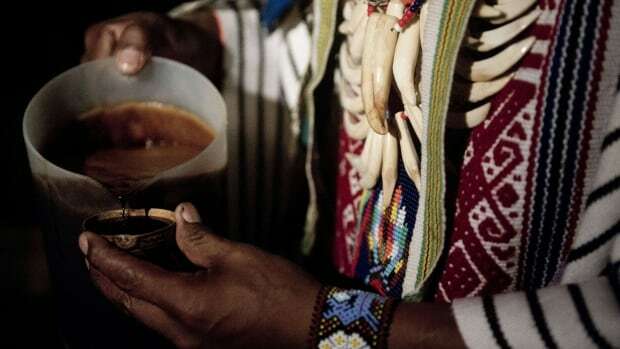 Some foods that are aged or preserved Global Affairs Canada says ayahuasca ceremonies are not regulated and there is no way to assess the safety of any of the services, the operators or the shamans. “Spiritual cleansing and ayahuasca ceremonies, offered by shamans and other individuals, involve taking substances that can cause medical complications and can severely impair cognitive and physical abilities. Exposure to these substances has led to serious illness, injury, assault and even the death of several tourists. Ceremonies often take place in remote areas with no access to medical or mental health facilities or resources and limited communication with local authorities,” the department says on its website. Why are medical researchers interested in studying ayahuasca? Studies suggest ayahuasca could be useful to treat psychiatric disorders and addictions. Some Canadian doctors have expressed concerns about the lack of high-quality evidence compared with conventional pharmacological treatments for addiction, such as suboxone and methadone for opioid users. Tea ceremonies involve non-medicinal aspects such as singing, which can complicate the efforts of researchers to isolate the effects of the drug when tested in clinical trials. Health Canada said an institution can apply to access restricted drugs listed under Part J of the Food and Drug Regulations for laboratory or clinical research.